Happy holidays to all. Here’s to the notion of taking each moment and living it in peace, as Jackson and Miller wrote about…See you on Sunday, I hope! 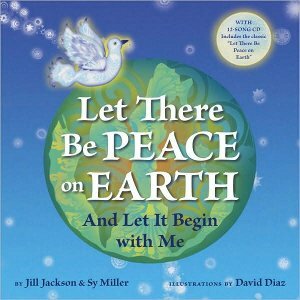 LET THERE BE PEACE ON EARTH: AND LET IT BEGIN WITH ME. Text copyright © 1955 by Jill Jackson and Sy Miller. Illustrations copyright © 2009 by David Díaz. Reproduced by permission of the publisher, Tricycle Press, Berkeley, California. 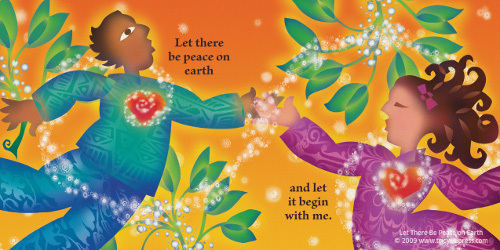 Thank you for the beautiful, colorful celebration of peace on earth! Have a great holiday! Beautiful spreads. Thanks, and Peace to all :). 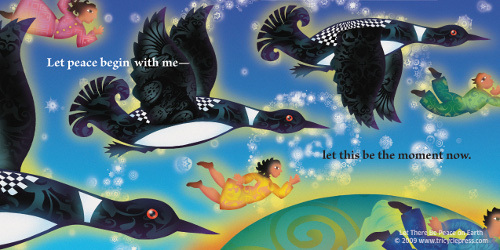 I absolutely love how many songs I learned as a kid get turned into picture books!!! (Leading me to believe that a.) I was either raised by hippies [yes] or b.) that pretty much there’s a song for everything, and I know practically all of them [again, yes]. I really, REALLY like this. And just want you to know? My mother has totally STOLEN my Sean Qualls book. We are SO having a Christmas throw-down over her penchant for stealing my picture books. It’s war ’round here. Merry Christmas, Jules! Lovely art is such a nice way to celebrate, as is rereading David Sedaris’s Holidays On Ice for the five hundredth time, which I did yesterday. Just saying. Tanita, I am not sure that you’ve internalized this particular song, what with your talk of Christmas throw-downs. Of course, at this point, in my family, we are all trash-talking about who is going to whup who on Christmas at Guitar Hero. Ah, holidays. I hope you and your family have a wonderful Christmas! I’m sure you’ll have a grand holiday with those two beautiful young daughters of yours. 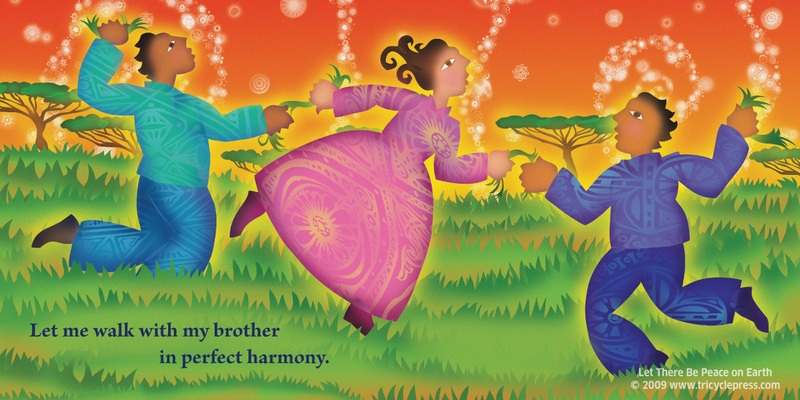 Thanks for highlighting these gorgeous illustrations done by David Diaz.